The former Cabinet Minister and Member of Parliament, who was well known as the ‘Voice of Summer’, passed away at the age of 92. 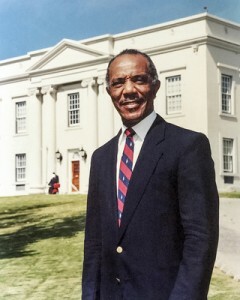 Premier David Burt, who is currently abroad with his family paused to remember the service of Mr. Woolridge who he said, “through his own strength of character came to symbolize the era over which he presided in Bermuda’s tourism”. Acting Premier and Minister of Public Works Lt/Col David Burch said: “On behalf of the Government and people of Bermuda I wish to express sincere condolences to the entire Woolridge family. The Cabinet Office also advised that a Book of Condolence for public signing would be available at the Cabinet Office, 105 Front Street, from Thursday, 30th August, until the day before Mr. Woolridge’s funeral, between the hours of 10am and 4pm. PLP Chairman Owen Darrell also extended sympathies, saying, “The Progressive Labour Party would like to extend our condolences to the family of former Minister and Member of Parliament, the Hon. C.V. Jim Woolridge. “Politically, the Hon. C.V. Jim Woolridge was a member of the Class of 1968, and he served in Parliament as the MP for Smith’s South until his retirement in 2001. He served in various capacities, but was most well known as the Minister of Tourism, a Cabinet position he held for 14 years. He also served as Deputy Premier. “In the community, Mr. Woolridge was well known as the ‘Voice of Summer’. He was an avid cricketer in his younger years, and a member of the Flatt’s Victoria Cricket Team, aka the Mighty Flatt’s. He would be heard all summer commentating cricket matches over the airwaves, and his voice was synonymous with cricket in Bermuda. “It is a very sad day as we mourn the passing of a true legend,” the Bermuda Cricket Board said in extending condolences to the family and friends of Mr Woolridge. “Mr. Woolridge spent over 50 years as a cricket commentator creating the brand ‘The Voice of Summer’ followed and loved by cricket fans across the country,” the BCB noted. “Mr. Woolridge was a wicket-keeper batsman for ‘The Mighty Flatts’ and made his debut in the Eastern Counties competition at the tender age of 15 years old. “Mr. Woolridge was a huge lover of our great game and fervently believed it to be the greatest character-building sport in the world. Lloyd Smith, President of the BCB, said: “It is a very sad day as we mourn the passing of a true legend. Mr. Woolridge is embedded in the culture and history of our game in so many ways and has touched the hearts of so many Bermudians and tourists over the years. Update 4.15pm: Minister of Economic Development and Tourism Jamahl Simmons today expressed his condolences on the passing of C.V. Jim Woolridge saying, “I wish to extend my sincere condolences to the family of late C.V. Jim Woolridge. “Today, Bermuda has lost one of our most admired and revered Tourism Ambassadors. Jim Woolridge’s legacy will be his spirited and unwavering support of the island’s Tourism and hospitality industry. Update 5.20pm: One Bermuda Alliance Leader Jeanne Atherden said, “The One Bermuda Alliance joins all Bermuda in mourning the death of The Hon. C. V. “Jim” Woolridge CBE, JP. We send our condolences to his family. “We remember Jim as an outstanding and astute politician who worked tirelessly on behalf of Bermuda. “As the Tourism Minister he was a great ambassador for the Island and wherever he went he was always promoting tourism in Bermuda. “Many people will fondly remember his commentary on cricket matches and he will forever be known as “The Voice of Summer” and someone who brought his love of cricket into our homes.